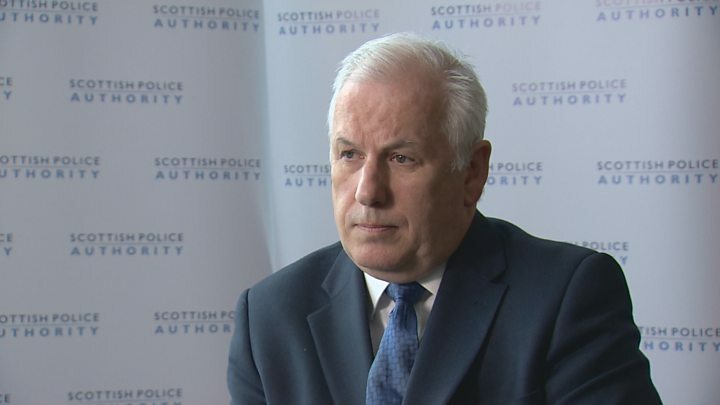 Scotland's police watchdog has criticised "dysfunctional" relationships at the top of the Scottish Police Authority board. A review by HM Inspectorate of Constabulary in Scotland described a "fundamental weakness" at the board. It also criticised a decision to hold meetings in private, saying the SPA needed to "genuinely engage". SPA chairman Andrew Flanagan is to step down from the role, after a row about transparency at the board. The HMICS report is the latest in a series of probes into governance at the SPA, with two Holyrood committees issuing critical reports and calling for Mr Flanagan's resignation - moves the report describes as "significant". The outgoing chairman highlighted that the report contained no evidence to support allegations of secrecy or inappropriate decisions being made. The long-running row stems from a decision - since reversed - to hold board meetings behind closed doors and only publish agendas on the same day. A dispute over this saw one member, Moi Ali, resign from the board. She subsequently said she had felt "bullied" and that Mr Flanagan had told her that publicly stating opposition was a resignation matter. After a series of heated committee hearings, MSPs announced that they did not have confidence in Mr Flanagan's continued leadership of the SPA, and he subsequently indicated he would quit once a successor is found. The latest report, from inspector Derek Penman, found "positive signs of improvement" in SPA board operations over the last 18 months, with improved relationships between the SPA and Police Scotland and the development of the Policing 2026 strategy described as a "major milestone". However, Mr Penman said the "recent parliamentary scrutiny and media concerns over openness and transparency have weakened public confidence in the SPA and detracted from its ability to perform its statutory function". He described the decision to hold meetings behind closed doors as "precipitous", and said it "should not have been implemented" until signed off by the board in full. Mr Penman welcomed the decision of the board to revert to holding meetings in public and publishing committee papers in advance, but wrote: "I am aware that some board members continue to maintain that their decisions to implement private meetings and publish papers on the day of the board were essentially correct. "There is a fundamental need to listen to the views of stakeholders to maintain public confidence, and on this occasion the SPA has failed to do so until pressed by parliamentary committees. "The SPA must recognise the legitimate interests of parliament, local authorities, staff associations, the press and the wider public in the scrutiny of policing in Scotland." Former board member Ms Ali said she was "really concerned" to hear that some board members still backed the private meetings. She said: "This is a public authority, one of the biggest in Scotland, and it's funded by taxpayers. And there are people on that board who believe that those taxpayers and the media do not have a right to know what that authority is doing. That worries me." Mr Penman was also critical of other senior managers including John Foley, the chief executive of the SPA, saying there was "fundamental weakness" in current structures. He said: "My inspection has identified shortcoming in the capacity of the chief executive, senior managers and committee support service to provide the level of expert advice and governance support needed by the board. "This is a fundamental weakness in the current executive structures and I therefore welcome the recent announcement that there will be a review of the way the SPA board can be better supported to deliver its statutory functions. "I also found dysfunction in the relationship between the chair and chief executive, and identified challenges for the chief executive and his senior management team in managing long-term secondments and absences. This is undoubtedly impacting on the effectiveness and efficiency of the SPA to perform its statutory function and should be addressed by the proposed review." Labour's Clare Baker said Mr Foley "must now consider his position", calling for a "complete overhaul of the management structure" at the SPA. This was echoed by Lib Dem Liam McArthur, who called for "root and branch reform". 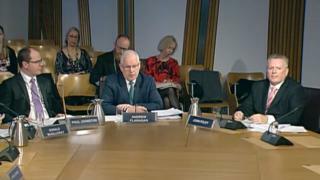 Jackie Baillie, acting convener of the public audit committee, said the group had been "unimpressed with Mr Foley's evidence" and said it was time for the SPA to "improve its tarnished reputation". In his response to the report, Mr Flanagan said the SPA had "already acknowledged recent mistakes made" and had "responded accordingly". He said: "Two charges that have been levelled at the SPA in recent months is that we were creating an organisation to keep secrets, and that we were inappropriately taking decisions behind closed doors which should have been made in public. "It is notable that the HIMCS inspection report contains no evidence or findings that would support either of those accusations. "We also welcome that the report found no evidence of a 'bullying culture' within the SPA, and I hope that this finding is given as much prominence as the original allegation." A number of changes have been instituted in the wake of the dispute, including the appointment of a deputy chairperson and a commitment to hold meetings in public wherever possible, which Mr Flanagan highlighted in his response. He added: "While I accept that openness and transparency is an important aspect of the work of the SPA, I also welcome the acknowledgement of by HMICS of positive progress in the governance of the SPA, our commitment to good governance, and a genuine commitment by SPA board members to putting policing before personal interests." Justice Secretary Michael Matheson said he was grateful to Mr Penman for the report. He said: "I am encouraged by their recognition that SPA Board operations and relationships have strengthened, reflecting a genuine commitment to good governance and a clear commitment to improving policing. "The report will help inform the review I announced last week to consider how the executive of SPA can best support the board and the chair to take informed, transparent decisions." Mr Penman will give evidence to Holyrood's justice sub-committee on policing about the report on Thursday.